There exists a mystery concerning the presence of Australian marsupials (pouched mammals) in following the great biblical flood of Noah. Prior to modern times, the continent's mammals were almost exclusively marsupials and monotremes. Most of the 140 species of marsupials in Australia are found nowhere else in the world; the opossum is found in the Americas. This overwhelming presence in Australia must be explained by factors that affected them during their reoccupation of the post-flood world. Evolutionists frequently use this mystery as an argument against credibility of Christianity as well as creation science, claiming that creation is unable to adequately explain this distribution of animals. However, evolutionist also have the problem of explaining the situation. They generally theorize that the opossum was the primitive ancestor of the mammals before the continental breakup of a southern landmass called Gondwanaland. It is thought that Australia and South America were once connected, and following geographic separation the opossum developed into the various marsupials which are now on Australia. Why the opossum was the only mammal to be on the Australian continent when it separated from South America, or the only one to survive. how it evolved into the range of creatures that exist today which are in so many ways similar to placental mammals. The existence of fossil marsupials on every continent. The existence of a fossil platypus tooth in South America. 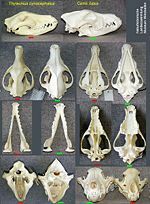 Skull comparison of Tasmanian Tiger and Gray Wolf. A most striking factor for consideration is the existence of numerous marsupial and placental mammals that are virtually identical to one another with the exception of the distinctions in their reproductive systems. There was a marsupial wolf called the Tasmanian Tiger that was hunted to extinction. There is also a marsupial squirrel, anteater, mole, mouse, et al. Chris Ashcraft has suggested that the marsupials are of the same created kind as their equivalent placentals, and that God designed them with the ability to develop varieties with either placental or marsupial reproductive systems. The distribution pattern of marsupials is very difficult to explain by natural mechanisms, and the situation seems to imply interference or added assistance. At the 2nd International Conference on Creationism in 1990, John Woodmorappe presented a paper which proposed that a postdiluvian civilization intentionally colonized Australia with marsupials. Perhaps as creatures spread out from the mountains of Ararat after the flood, marsupials arrived in Australia ahead of the placentals, before Australia was totally cut off by rising sea levels at the end of the ice age. Once it was cut off, they were protected from competition and predation. In other parts of the world that were not isolated, or isolated later, by the rising sea levels, the placentals replaced any marsupials there. This page was last modified on 27 October 2014, at 01:05.